On Wednesday, we celebrated World Voice Day. As a result of this obscure holiday, we looked at the vocal cords, which are found within the larynx and are arguably the most important part of the body when it comes to making the human voice. That said, the vocal cords are fairly useless without the assistance of the lungs, which push air through the vocal cords, thereby vibrating them and making a sound. Of course, not every sound we make requires the lungs, at least not the variety of clicking sounds that are common in a large number of African languages. Once air passes through our vocal cords and causes them to vibrate (or not in the case of unvoiced phonemes), it then passes into our mouths where our mouths and tongues act as filter. This filter changes how well certain frequencies of sound are omitted from the mouth. Various mouth positions for vowel sounds. Whilst the vocal cords dictate whether or not the phoneme is voiced or unvoiced, the mouth is mostly responsible for vowels, particularly in the English language. The tongue also plays a part in the formation of vowels, whilst the lips and teeth play a more important role in the production of consonants. Unsurprisingly, for sounds like th in both "think" and "though" in which the tongue sits against the teeth, the phonemes are known as dental. For sounds like the letters f and v in English, they are known as labiodental as both the teeth and lips play a role in making the sounds. When phonemes are made by placing the tongue on the alveolar ridge, the point in the mouth behind your upper incisors, the sounds are known as alveolar phonemes. When you use your voice to make a sound by pressing your tongue just behind this point, it's known as post-alveolar. Palatal phonemes are made pressing the tongue against the palate, and velar phonemes are when the tongue is against the soft palate. 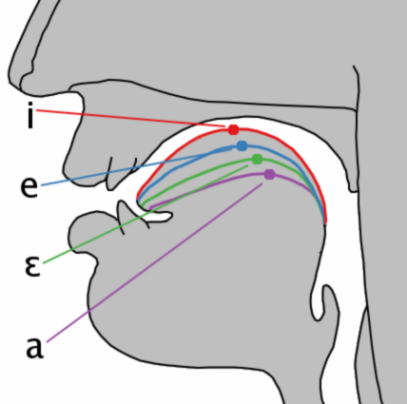 Right at the back of the mouth pharyngeal phonemes are made against the pharynx and epiglottal phonemes against the epiglottis, but neither of these are present in the English language. In addition to the vocal cords, mouth, tongue, lips, and teeth, the nose and nasal cavities can also play a part in the production of sounds. The sounds for the letters m and n are both produced nasally, which is why they are really difficult to say when you have a cold or blocked nose. Although the vocal cords are pretty neat, the entire system that makes up our voices is incredible. We'll see you on Monday for our weekly language profile.